This Stage is relevant to those who need to develop language skills in English and enhance their career growth. This Stage pays special attention to communication skills in order that students could function efficiently in English particularly in their place of work. A certificate will be issued to those who successfully complete Stage II of the above programme. Ambalangoda, Ambalantota, Ampara, Anuradhapura, Badulla, Bandarawela, Batticaloa, Colombo, Galle, Gampaha (Miriswatte), Hatton, Jaffna, Kalutara, Kandy, Kegalle, Kilinochchi, Kurunegala, Matara, Monaragala, Mannar, Polonnaruwa, Puttalam, Ratnapura, Trincomalee and Vavuniya. All applicants should be above 18 years of age. Successful completion (any 6 subjects) of the G.C.E. (O/L) examination. The Stage I/ll for which an applicant is selected will depend on his/her performance at a Placement Test to be held on 17th December 2017. Applicants who have successfully completed the OUSL Certificate in Basic English are eligible to apply and will be registered for Stage 2 of this programme. Such applicants are not required to sit the Placement Test. Such applicants should send in duly completed application forms on or before the closing date of application. 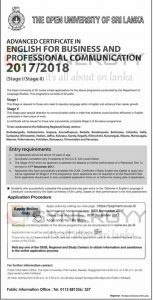 Students who successfully complete this programme may gain entry to the ‘Diploma in English Language & Literature’ conducted by the Open University of Sri Lanka, based on their performance in the final assessment.